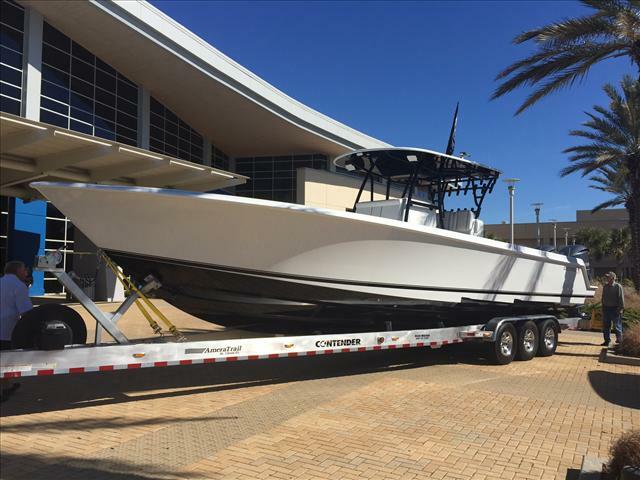 2017 Contender 39 ST **DEALER DEMO** If you are in the market The Contender 39 Step Hull Tournament is designed to be the big dog on the big days. 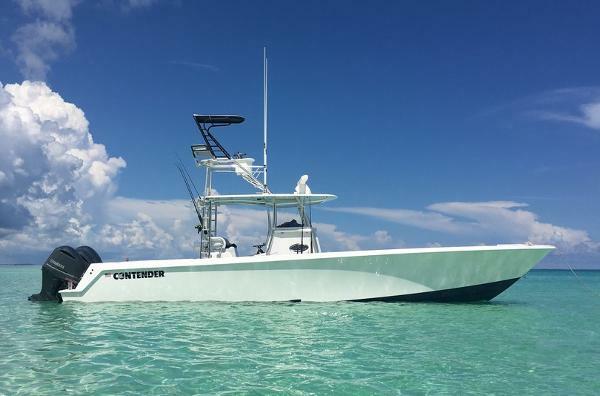 Contender is dedicated to building an offshore fishing boat that combines fuel efficiency with speed, comfort, and fish-ability. The 39 stepped hull delivers improvements in fuel efficiency, running speed and performance not found on competitors boats. With 500 gallon fuel capacity, youll have the long range you need to find the fish, or explore a new destination.As the flagship of the tournament fleet, only great things may be expected of this monster. Offered in both of the cutting edge stepped hull or traditional deep-V design, it is well known among savvy boaters that this vessel outperforms competing manufacturers models in the 40 foot class. Options Include: Custom Sport Console, Custom Helm Pod for Sport Console, Additional Batteries w/ Switch, Additional Bilge Pump, Custom Slide for Electric Head, Custom Electronics Box w/ Recessed Locking Pocket Door, Three Sided Polycarb Enclosure, 2nd Light Bar on T-top L.E.D. 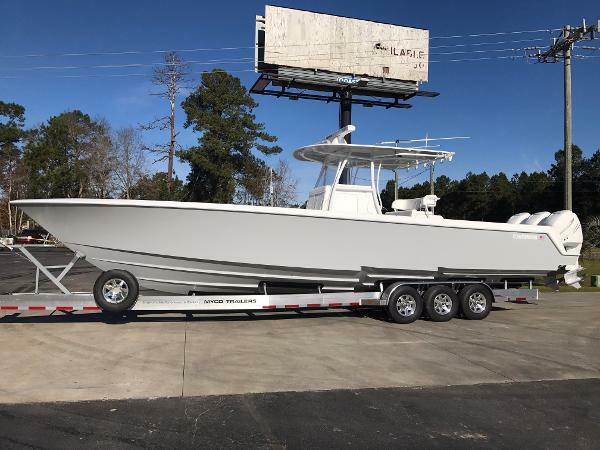 Style, Additional Spreader Light on T-top, Rupp Top Gun Outriggers w/ Built in 18' Radial Arms, Powder Coat Package, Fiberglass Hardtop XL w/ Custom Fiberglass Radio Box, King Fish Rod Holders, Additional Rod Holders on T-top, Sport Top Upgrade, Hard Top Speaker Boxes, Aft Fish Boxes Drain Overboard w/ Macerator Pumps, Forward Coffin Box XL, Electric Lift for Custom Coffin Box, Gemlux Flush Mounted Scoops, Livewell Lights, Custom Over sized 3rd in-floor Livewell, Etched Livewell Lids, Sea Chest Livewell Plumbing w/ Upgraded 1500 GPH Pumps, Additional Console Rod Holders, Additional Gunnel Rod Holders, All Gemlux Hardware Upgrade, Freshwater, Raw Water, Under Gunnel Multi-Color Lights, Under Water Multi-Color Lights, Pop Up Cleats Stern and Mid Ship, Garelick Built In Transom Ladder, Bilge Light, Shore Power, Upgraded Edson Wheel, K-Plane Model 280S Trim Tabs, Flush Mount Bow Light, Custom Leaning Post w/ Backrest, Bull Nose Cushion Upgrade, Footrest for Custom Leaning Post, Cockpit Coaming Bolsters, Teak Inside Console, Custom Bentley Stitching and Upholstery, Awl Grip Under Gunnels and in Bilge and Custom Myco Trailer. Electronics Include: Dual Garmin 8617's, Unbelievable JL Marine Sound System w/ Fusion Head, JL Amp and Subs, Garmin Open Ray HD Radar , Garmin Auto Pilot, Rigid Industries Custom 54" Light Bar White to Match, Dual Garmin VHF 300's, 1KW Thru-hull Transducer, GMX 52 Satellite Weather and Radio. For more information on this 2017 Dealer Demo Contender 39ST please call 843-399-9283. 2016 Contender 39 ST This boat is a new boat and has been used as a demo. It has never been titled! Take advantage of this new boat that has been loaded with options. 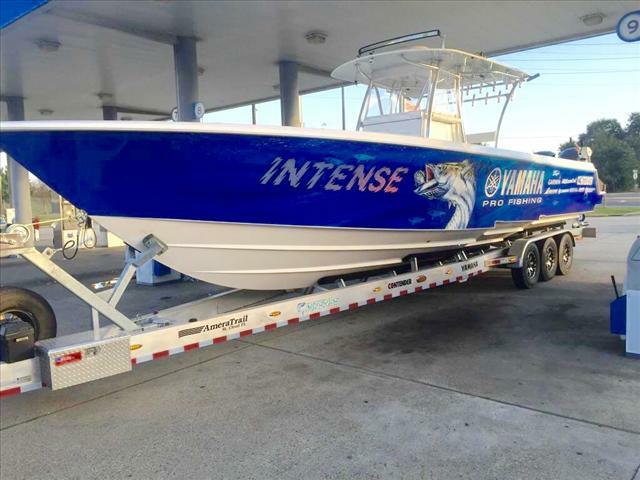 The hull design is superior to the competition because simply put, it’s the latest design developed in 2012 by the world renowned John Cosker, founder of Mystic Powerboats, who is a legend in the Performance Boating industry. The early step hull designs HAD pros and cons, but almost 20 years later he reached perfection with the 39ST. Below are the performance numbers of this particular boat with ½ to ¾ load. 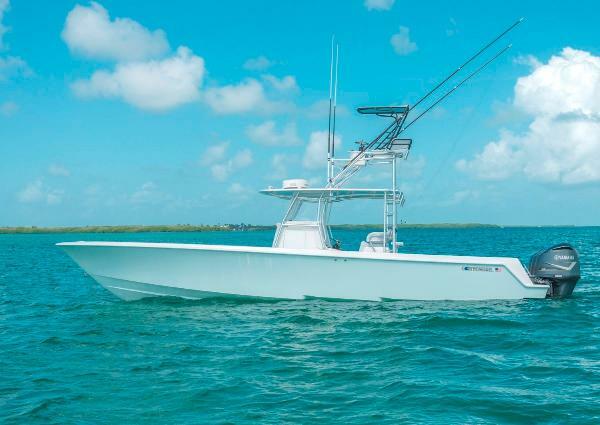 2015 Contender 39 ST This is a Tournament Fisherman’s Dream!!! 2015 Contender 39 ST powered by triple 350 Yamaha Four Stroke engines with Joystick and only 130 hours! Fully equipped with twin Garmin 7612 XSV, open array radar, VHF, Integrated headsets, 12 speaker stereo system, engine & console covers and Ameritrail trailer. Top speed of 71 mph! 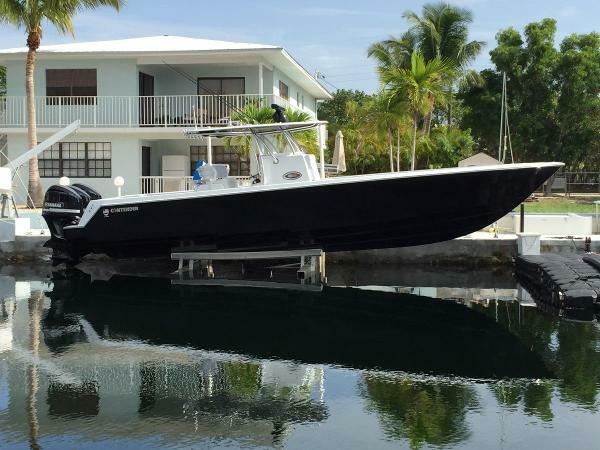 2016 Contender 39 ST Here's your chance to get a 2016 contender 39st rigged with triple Yamaha 300s. This perhaps is one of the best built 39s on the market. This has been used as a demo boat and never tilted so will be sold as a new boat. If you are serious about fishing look no further. 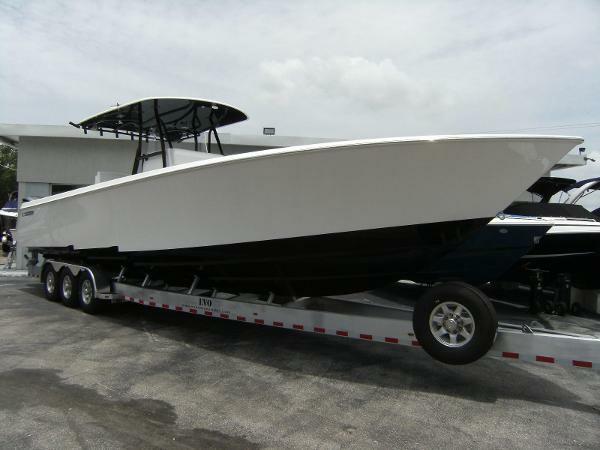 This boat comes with a 2016 amaratrail triple axle trailer and has a fold down upper station. Which allows the rig to be easily trailered. White hull with blue bottom. 500 gallons of fuel. Boats in flawless shape. 2016 Contender 39ST, Custom rigged for tournament winning by Contender Boats. You wont find another one with all these features anywhere. We had them use a custom Nautical Designes triple seat helm station for a tackle storage battle station. We had them add rear legs on the hard top for extra rod storage and rigging lines. Grey powder coat prevents glare to spot birds and fish without distraction. The Top has been upgraded to the sport top with custom fiberglass radio box and speaker boxes along with flush mount LED spreader lights. Boat is also equipped with a sea chest system which contains an extra pump should one go down while out on a fishing trip. Additional features include boarding ladder, LED live wells, additional fuel capacity (575 gallons)LED Livorsi trim tab indicator, 10 additional rod holders along the transom, and much more. 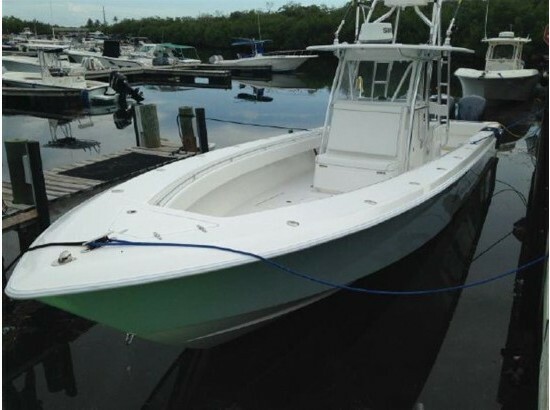 Give us a call or come by and view this beautiful fishing machine! 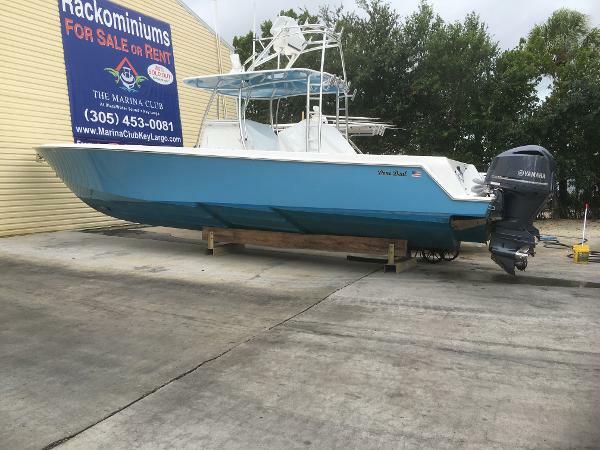 2013 Contender 39 ST 2013 Contender 39 ST with gen 2 350 Yamaha 4 strokes (ext warranties and very low hours) includes custom Amera-Trail Trailer Electonics include: Garmin 7215's Simrad AP 28 autopilot Open array radar GSD 26 chirp sounder epirb icom vhf fusion ipod radio with JL audio, speakers, sub, and amp Options include: additional house battery, additional bilge pump, electric head with Y-valve, custom powers boat works electronics box, windshield, custom sport console, 2nd led light on hardtop, forward spreader light, top gun outriggers with radial arms, kingfish rod holders, additional rod holders on t-top, fiberglass hardtop, aft fish box macerator pump, gemlux flush mounted scoop, livewell lights, clear lids, approximately 20 gemlux offshore gunnel rod holders, pop up cleats, freshwater system, raw water system, bilge light, garelick ladder, under gunnel lights, underwater lights, tilt steering, upgraded 380 k plane trim tabs, folding footrest on leaning post, custom fiberglass leaning post with custom backrest, built in frigid rigid cooler, cockpit coaming pads, rocket launcher on transom, extra rod holders on leaning post back rest, electric reel outlets, stainless shocks on all deck hatches, switches on dash, shore power with battery charger, split foot rest at console, custom boot stripe, etc. 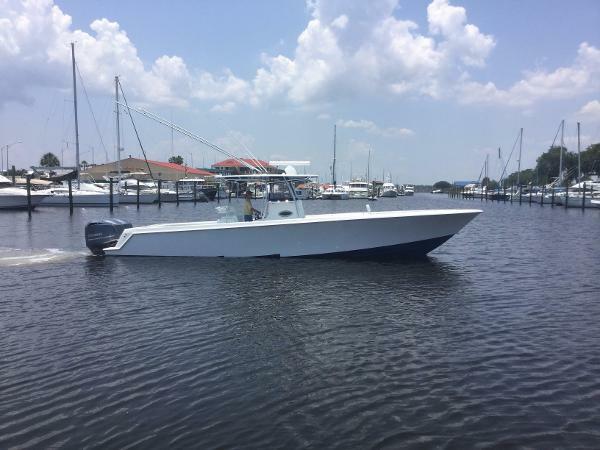 2015 Contender Offshore Center Console 39 ST, **Fully loaded and ready to fish today** This 2015 39ST is equipped with the latest and greatest electronics from Garmin, from the Open Aray Radar to the 8000 series head units to the latest auto pilot this boat has it all. Boat and trailer all also equipped with Rigid industries LED lights. Boat is available to be viewed by appointment only. Give us a call and schedule yours today!! 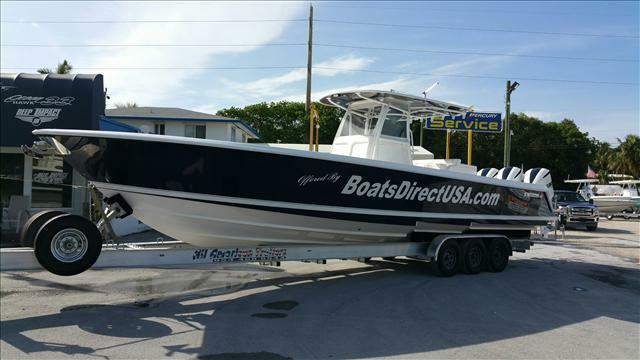 2015 Contender Sport Fishing Boats 39 ST, It is the boat true, die-hard fishermen dream of. The boat that has but one reason to exist: to help you catch the kind of fish that win tournaments, plain and simple. Powered by triple Yamaha 350hp engines, the Contender 39ST is untouchable in the open water, and yet, the 39ST really proves itself when conditions deteriorate. With a standard 500-gallon fuel tank capacity, you will take advantage of greater range while you get there faster, drier, and smoother than the rest. You will enjoy its dual 40-gallon livewells, enormous total fish box capacity of 615 gal. , and huge storage room on your offshore fishing rampages. 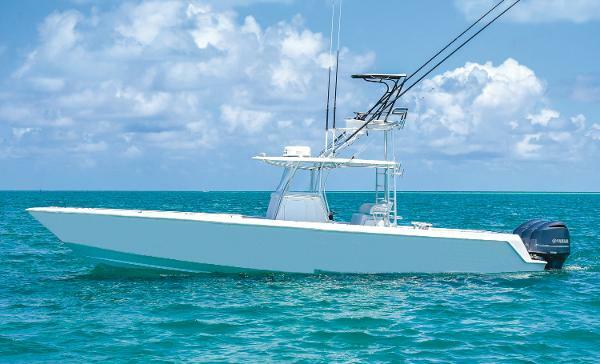 To experience the ultimate in offshore sport fishing performance, you have to experience the Contender 39ST. 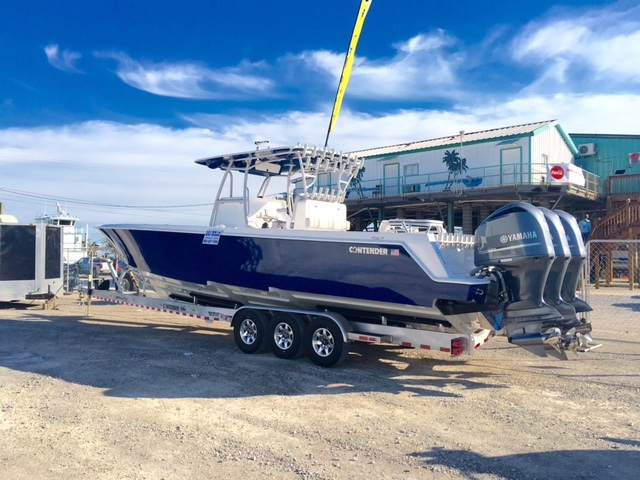 2015 Contender Center Conslole 39 ST, Custom rigged for tournament winning by Contender Boats. You wont find another one with all these features anywhere. We had them use a custom Nautical Designes triple seat helm station for a tackle storage battle station. We had them add rear legs on the hard top for extra rod storage and rigging lines. Black powder coat prevents glare to spot birds and fish without distraction. The Top has been upgraded to the sport top with custom fiberglass radio box and speaker boxes along with flush mount LED spreader lights. Boat is also equipped with a sea chest system which contains an extra pump should one go down while out on a fishing trip. Additional features include telescoping boarding ladder, LED live wells, additional fuel capacity (575 gallons)LED Livorsi trim tab indicator, 10 additional rod holders along the transom, and much more. Give us a call or come by and view this beautiful fishing machine!